WASHINGTON, D.C. – Washington Life Magazine’s March 2017 issue featuring the publication’s annual, much-anticipated “Young and the Guest List” hits newsstands on March 1. For the first time in the magazine’s 25-year history, Washington Life has printed two covers. The first features a group of noted journalists, including Muslim American reporter Noor Tagouri, who works for Newsy and is the first woman in a hijab to be featured on the cover of Washington Life. The others are Washington Post reporter and George Polk Award winner David Fahrenthold, CNN White House correspondent Sara Murray, NBC White House correspondent Hallie Jackson, Independent Journal Review White House correspondent Erin McPike and CNN political reporter Hunter Schwarz. 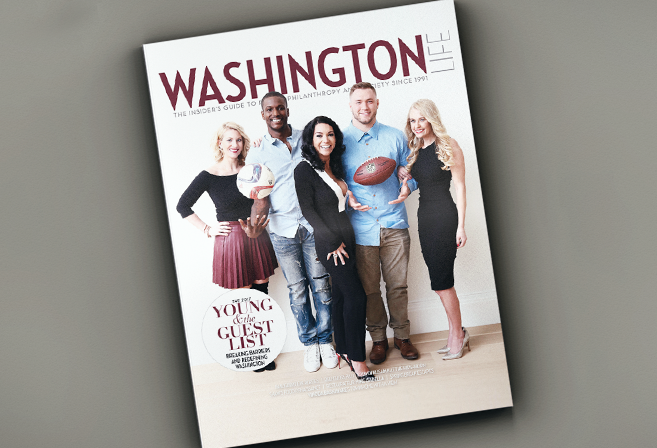 The second cover features Washington Redskins linebacker Will Compton, DC United goalkeeper Bill Hamid and three businesswomen: Bethany Kazaba, a co-founder of Neighborhood Retail Group, Lauren Culbertson, founder and principal of Millennial Bridge Consulting and Molly Brady, director of Jet Card sales at private jet company Jet Linx Aviation. BY THE NUMBERS: There are more than 300 names on the 2017 Young and the Guest List. Washington Life chose to photograph 40 people who caught our attention this year. The list includes 12 members of Congress. Four were photographed, including Rep. Elise Stefanik (R-NY), the youngest woman ever elected to the U.S. House of Representatives; Rep. Stephanie Murphy (D-Florida), a Vietnamese refugee who was rescued at sea by the U.S. Navy as an infant; Rep. Ruben Kihuen (D-Nevada), the first Latino from his state to be elected to the U.S. House of Representatives; and Rep. Scott Taylor (R-Virginia), a former Marine who, as one of his first acts in Congress, flew to Dover Air Force Base to meet the body of a fallen soldier from his district who was killed during an antiterrorism mission in Yemen ordered by President Trump. There are 49 journalists on the list. Aside from those appearing on the cover, Washington Life also photographed Washington Post Pulitzer-prize winning national reporter Wesley Lowery, “Hardball with Chris Matthews” producer Michael LaRosa and Daily Mail White House correspondent Francesca Chambers. Local anchors and reporters are also represented in our pictorial, including NBC 4’s morning anchor Aaron Gilchrist and meteorologist Amelia Draper; ABC 7’s morning anchor Jummy Olabanji; and Fox 5’s traffic and feature reporter Erin Como. The list also includes 24 sports figures, 21 chefs and restaurateurs, 29 entrepreneurs and 21 individuals working for non-profits, 1 cast member of Bravo’s “Real Housewives of Potomac” (Ashley Darby), as well as well as doctors, writers, public relations professionals and bloggers. Washington Life Magazine is Washington’s premiere luxury lifestyle publication, covering power, society, politics and philanthropy since 1991.